Inflation on the wholesale level rose in January at the fastest pace since 2012. The Bureau of Labor Statistics said higher energy prices sent the Producer Price Index higher for the fifth consecutive month. Even excluding volatile food and fuel costs, the index rose broadly with a year-to-year gain of 1.6%. The Federal Reserve has long said that it would like to see inflation around 2%. The broadest measure of inflation also increased in January, also led by higher gas prices. Gains in the Consumer Price Index also were widespread. Among the major categories, only used vehicles had lower prices than in December, the Bureau of Labor Statistics reported. Core prices – excluding food and energy – rose 2.3% from January 2017, suggesting the economy is growing closer to what the Fed considers a sustainable rate. A key measure of consumer spending – retail sales – grew more than analysts expected in January following an even stronger-than-reported rise in December. The Commerce Department said that only one of 13 retail categories did not have higher sales in January, and that was car dealers, who had extraordinarily robust gains in December. Excluding volatile automotive sales, retailers showed even healthier advances for the month. The year-to-year increase of 5.6% for all of retail sales compares with an average of 4.4% for the last 20 years. The Federal Reserve reported that industrial production declined in January, although manufacturing output rose for the second month in a row and the fourth time in five months. A fall in utility production, related to unseasonably warm weather, dampened output overall. 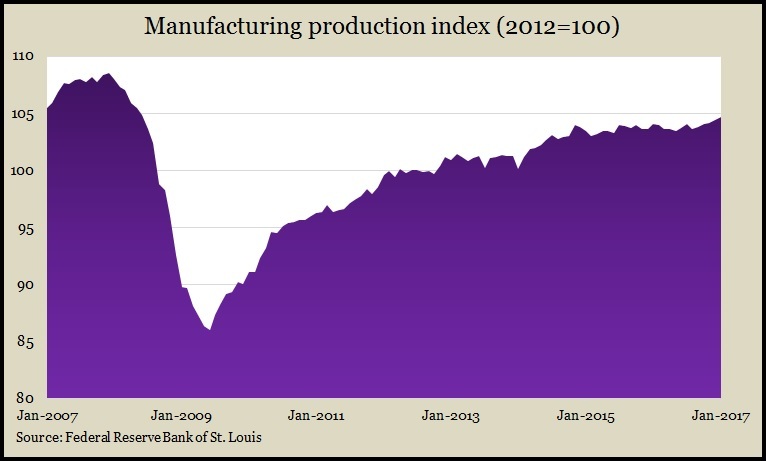 Despite head winds from a strong dollar, manufacturing production rose to its highest point since the Great Recession ended, although it still hasn’t recovered to pre-recession levels. Capacity utilization retreated to 75.3%, further from the long-term average of 79.9%, above which economists begin to worry about inflation pressure. Business inventories rose 0.4% in December, lagging a 2% increase in sales, according to a Commerce Department report. As a result, the inventories-to-sales ratio declined for its lowest level in two years, an indication that businesses are better aligning stockpiles with demand, which should allow them to operate leaner. The moving four-week average for initial unemployment claims rose for the second time in three weeks, a week following its lowest level since November 1973. The Labor Department indicator is 32% below the historical average, which suggests employers continue to be reluctant to let workers go. That could boost hiring and wages, which should fuel more consumer spending, resulting in more economic growth. The choppy recovery in U.S. housing continued in December with housing starts dipping 2.6% from their pace in November but remaining above pre-recession levels for the third month in a row. Single-family houses, which make up two-thirds of new houses, outpaced multi-family units, according to the Commerce Department report. Building permits suggested further construction, jumping to their highest annual rate in 14 months. The Conference Board reported that its index of leading economic indicators rose in January, for the third month in a row. The 0.6% gain, following increases of 0.5% in December and 0.2% in November, suggest continued moderate economic growth at least through the middle of 2017. The business research group said the broad base of gains among indicators, if continued, could lead to an acceleration of economic growth.